Defending Supercars champion Jamie Whincup and Walkinshaw Andretti United’s Scott Pye share victories on the second day of the Melbourne 400, the second round of the 2018 Virgin Australia Supercars Championship. Whincup triumphed in a 13-lap sprint race while Pye scored a victory in a longer 25-lap race. For Whincup, it’s his 109th Supercars win while Pye climbed to the top podium spot for the first time in a career. Whincup led from start to finish in the wet race to cross the line 4.2034 seconds ahead of yesterday’s winner Scott McLaughlin. A two of thirteen laps were run behind the Safety Car. The green flag came out on Lap 3. Whincup then built a gap and secured a dominant win ahead of two DJR Team Penske’s Ford, despite one mistake which cost him few seconds. Scott McLaughlin shared a podium with his teammate Fabian Coulthard. The Saturday’s second race, the third of four in the Melbourne 400, started on dry but ended on wet track. 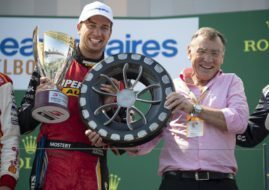 Some drivers made a change to wet tyres for the last five laps but Scott Pye stayed on slicks and managed to take his first Supercars win in a career. Jamie Whincup crossed a line closely behind (0.2612 sec) while Nick Percat (Brad Jones Racing) finished in the third place, scoring his seventh podium in a career.